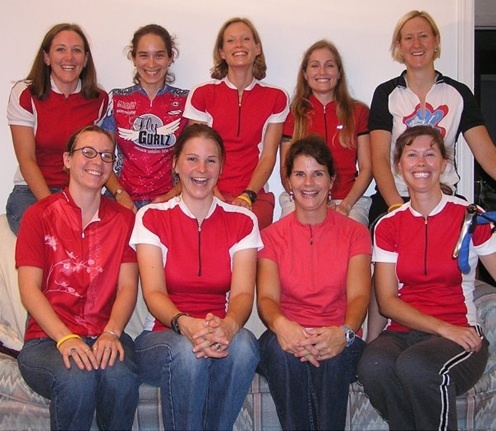 Back in 2006, Atlanta lacked a women’s only cycling club. Numerous clubs in the metro area had active female members and a few teams supported a handful of elite racers. But a club, strictly for women, that promoted cycling on all levels, from novice riders to recreational riders to aspiring and serious racers, on dirt trails and pavement, did not exist. A bold group of women saw this need and took action to fill this void. Thus, Sorella Cycling was formed by Alison, Aimee, Linda, Vera, Jennifer, Suzanne, Kari, Kate, and Molly (pictured below). Initially, our aspirations seemed modest – create a women’s only cycling club and race team. None of us had an inkling of the impact we could make or the rippling effect a successful endeavor would have on individual lives or the cycling community as a whole. The first meetings were held at each other’s houses, around wine & dinner and focused on the basics – what would we call ourselves, how would we fund the club, what would our kits looks like, how would we communicate, and maybe most importantly, who would want to join? Some decisions were easy – like the commitment to support race teams. We all had varying experiences with racing and certainly had competitive drives. It was important to all of us that women who raced should feel supported by teammates and the club and that women who were interested in racing should have the opportunity to find out if racing was for them. Everyone deserves that chance. It was also important not to exclude any discipline – each of us had preferences for dirt or pavement and also a great deal of respect for each other’s talents. We were also used to balancing and “doing it all” so it just made sense to include and promote all cycling disciplines. It wasn’t long before we had bylaws, sponsors, kits, a website & forum, race teams, club members, social events and group rides. We were so thankful for sponsors who took a chance on us – we’re humbled that some of them are still with us. Our race team members took a chance as well – we couldn’t offer free frames, kits or race entries, but the support & encouragement at races and training rides was something most of us hadn’t experienced before. Club members took a chance too – every time one of our friends joined, we were excited and even more committed to making this club special and giving back to the cycling community. I also remember the first member who joined who wasn’t a close friend of anyone on the team or club, none of us knew anyone in Villa Ricca. It was then that I realized we had started something that had the potential to grow and positively impact women across GA. we made mistakes and had set backs, but we learned, improved and continued to grow. “Sorella” in addition to meaning “sister” in Italian, is also associated with good sportsmanship and community involvement throughout the southeast. I am incredibly proud of the women who started Sorella and those who have stepped in throughout the years to keep the club and team going.